WASHINGTON (AP) — President Donald Trump has offered former Utah Gov. 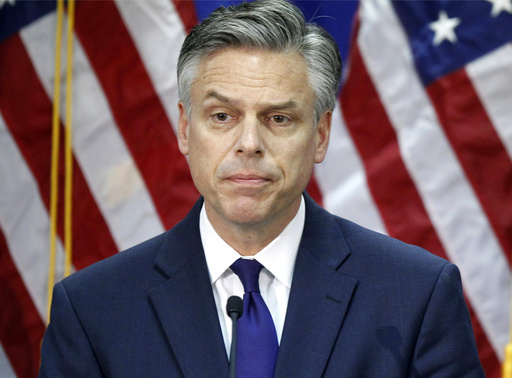 Jon Huntsman the position as U.S. ambassador to Russia, a high-profile and sensitive post amid investigations into contacts between Russian officials and the Trump campaign. Trump made the offer to Huntsman earlier this week, according to a White House official not authorized to discuss the move publicly until it is announced. Huntsman has indicated that he will accept the post, the official said Wednesday. The former governor did not immediately return a request for comment. Huntsman has twice before served as an ambassador. He was the nation’s top diplomat to Singapore under President George H.W. Bush and then served in that role in China under President Barack Obama. Huntsman, who ran for president in 2012, was also briefly under consideration to be Trump’s secretary of state. The former governor, a Mormon, had an up-and-down relationship with Trump during last year’s campaign. He was slow to endorse any candidate for the Republican nomination though he did back Trump once he became the presumptive nominee. But Huntsman then called for Trump to drop out after the October release of a 2005 video in which Trump is captured on a hot microphone making lewd comments about women. He said then that the “campaign cycle has been nothing but a race to the bottom” and called for Trump’s running mate, then-Indiana Gov. Mike Pence, to top the GOP ticket. Trump also went after Huntsman during his tenure as ambassador to Beijing. In a series of tweets in 2011 and 2012, the celebrity businessman called Huntsman a “lightweight” and “weak” and claimed that China “did a major number on us” during his tenure. But Huntsman and Trump buried their differences during the transition, the official said. If confirmed, Huntsman would become one of the highest-profile U.S. ambassadors, helming the diplomatic mission to a country that has that has seen its relationship with the U.S. deteriorate in recent years, particularly after accusations that Russia meddled in last year’s election. Huntsman would also take the post amid ongoing investigations into contacts between Trump’s team and the Kremlin. Trump’s first national security adviser, Michael Flynn, was forced to resign after misleading Pence about the nature of his conversations with the Russian ambassador to the United States. And Attorney General Jeff Sessions has faced Democratic calls for his resignation after he did not say in his Senate confirmation hearing that he had two conversations with that same ambassador. Sessions has recused himself from any investigation of Trump’s ties to Russia. Lemire reported from New York. Associated Press writer Ken Thomas contributed to this report.